(CNSNews.com) - The federal government collected record amounts of both individual income taxes and payroll taxes through the first ten months of fiscal 2017 (Oct. 1, 2016 through the end of July), according to the Monthly Treasury Statement. Through July, the federal government collected approximately $1,312,691,000,000 in individual income taxes. At the same time, it collected $976,278,000,000 in Social Security and other payroll taxes. Prior to this year, fiscal 2015 held the record for individual income tax collections through July. That year, the Treasury collected $1,309,431,860,000 (in constant 2017 dollars) in individual income taxes in the first ten months of the fiscal year. Last year (fiscal 2016), individual income tax collections from October through July dropped to $1,293,490,000,000 (in constant 2017 dollars). 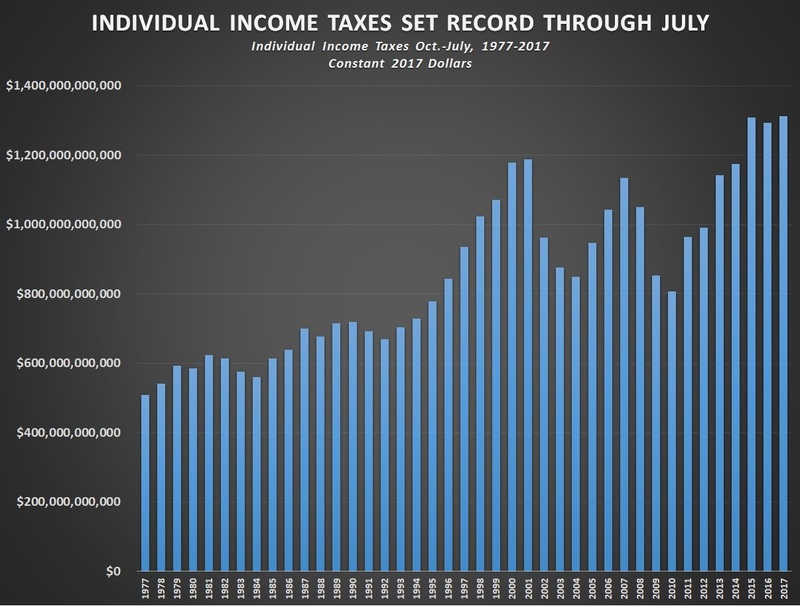 This year’s record of $1,312,691,000,000 in October-to-July individual income taxes is $3,259,140,000 more than the 2015’s previous record of $1,309,431,860,000. 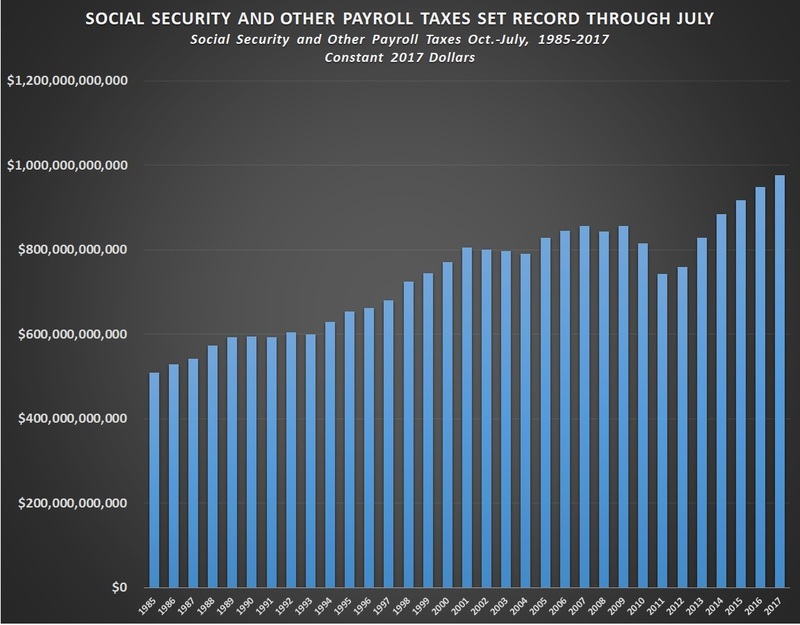 Before this year’s record $976,278,000,000 in October-through-July payroll tax collections, fiscal 2016 held the record at $948,709,020,000 (in constant 2017 dollars)—or about $27,568,980,000 less than this year. Overall federal tax collections in the first ten months of fiscal 2017 were $2,739,861,000,000. Yet that did not the record for October-through-July total federal tax collections. In the first ten months of fiscal 2015, the Treasury collected $2,741,079,280,000 (in constant 2017 dollars) in total taxes. That was $361,218,280,000 more than this year. While the Treasury has been collecting record amounts of individual income taxes and payroll taxes this fiscal year, some other categories of federal tax revenues have declined since 2015. For example, in the first ten months of fiscal 2015, the Treasury collected $272,904,380,000 (in constant 2017 dollars) in corporate income taxes. In the first ten months of fiscal 2017, the Treasury collected only $232,294,000,000 corporate income taxes. In the first ten months of fiscal 2015, customs duties were $30,705,180,000 (in constant 2017 dollars). In the first ten months of fiscal 2017, they were only $28,427,000,000. In the first ten months of fiscal 2015, excise taxes were $68,686,630,000 (in constant 2017 dollars). In the first ten months of fiscal 2017, they were only $65,187,000,000. Even as it was collecting record individual income taxes and payroll taxes in the first ten months of fiscal 2017, the Treasury still ran a deficit of $566,022,000,000. That is because while the overall federal tax collections for the period were $2,739,861,000,000, overall federal spending was $3,305,882,000,000.